It’s hard to explain the pleasure I get from this show. Something draws me in despite the fact that much of this show gives off the tell tale signs of a tape I wouldn’t gravitate to, nor listen to more than one time. However, when I step back a bit, I see this show as a wonderful example of many things the Dead were all about, and it makes perfect sense as an inclusion in the Listening Guide. This was a tape I never traded for back when I was a rabid collector. It just never made it anywhere near the top of the list of shows I wanted to seek out. The Grateful Dead, if you weren’t already aware, were famous for complete failure when it came to rising to an occasion. The list of downright disappointments across great musical events is like a calling card for this band. “Got a big event coming up? Invite us, and we’re sure to miss stepping up to the plate.” While the enormity of underwhelmment (will this word ever get in the dictionary?) can vary from person to person, calling to mind such rock events as the Monterey Pop Festival, Woodstock, and the Dead’s trip to Egypt, all ring true with a common theme of let down. And that’s undoubtedly why I always took a pass on the tape from 1982’s US Festival. It was a landmark musical event. How well could the Dead possibly have played? I’ll be the first to say it: the Dead didn’t play anything earth shattering at their breakfast show on September 9th 1982 (they went on at 9:30AM). So why is it showing up on the Grateful Dead Listening Guide? Well, in part, I think it comes down to the fact that this show demonstrates a certain quality of the Dead that might not often be glorified on these pages. At this show, the Dead thoroughly nail a vibe that I’m not normally drawn to. It’s an undercurrent you can hear running through songs like Minglewood, Samson, Man Smart (Women Smarter), and Not Fade Away on this date. It must be a Bobby vibe of some sort. Regardless, those tunes don’t generally call to my heart like many others. Yet, on this date, there is no mistaking that the Dead we playing this particular vibe in perfected form. I find myself completely swept up by what’s going on, and therefore feel this is an ideal show to feature here. This particular facet of the Grateful Dead is another hallmark characteristic of what their music was all about, and it deserves some attention. Musically, this is actually one of the most approachable Dead shows I can think of. The band doesn’t take a tremendous amount of risk here, perhaps due to the scale of the stage they were playing on. And yet, perhaps because of the technical difficulties early on, they seemed to become possessed with a spark of energy and passion, as if to compensate for the floundering mechanical toe stubbings. We end up with a set list that juxtaposes the standard format of a Dead show, normally starting with a straightforward first set leading to more explorative improvisation in the second, and come away with a show that both plays like a Grateful Dead greatest hits record, yet is also infused with many tremendous highlights woven into the fabric of the music. While it is divided into two sets (mostly due to the technical issues needing to be resolved), the show plays like one long extended single set, overall. This all somehow makes sense when we consider that we were smack dab in the middle of the era where first sets could out shine second sets. And thus, of all the “big moment” shows in the Dead’s history, this one actually does the best job of bucking the trend (or curse) of always falling short. Oh, and this audience recording is so good, it will knock you flat out of your head. Crystal clear outdoor Dead goodness, and I struggle to bring to mind any audience tape that delivers Phil’s bass any better. It’s impossible for me not to be drawn in to a show that opens with a Playin’ In The Band. Being one of my favorite Grateful Dead musical vehicles, and so rarely seen in the show opening slot, it’s a convergence that always grabs my attention. After a long opening passage on this tape where the band is getting set to play, the song sparkles into existence, loud and clear. It doesn’t possess a long jam, but before it slips into Shakedown Street, we sense a shredding of the fibers which tether the music to the ground. Just as things begin slipping beautifully over an edge, they coil back in and reach Shakedown. Shakedown Street delivers its wonderfully sultry disco-ish groove, and we are quickly finding ourselves fully immersed into the infectious world of the Dead’s music. Everything shimmers in the hot morning sunshine. Minglewood follows, and it’s as if the band has finally slipped into fourth gear. Garcia explodes with one powerful guitar solo after another, and everything boils. Then the technical gremlins appear, as Bobby informs us that the amps are dropping like flies in the heat. Eventually, things are resolved, and the band manages to step right back into the vein with a bone shaking Samson & Delilah. The set closing China>Rider is pure 1982 perfection. The song duo charges forward like a stiff breeze drawing everything into its wake. Glorious pinwheels and sparklers are cast into a blurring canopy of sound which twists endlessly inward and outward. This is the Dead at the height of 1982 power. Everything ties together, leaving us in a harmonious state of musical joy with the band. And then they take a set break to deal with more technical issues. Set two on this tape starts off with the soundboard recording covering the first few moments of Sugaree. It is expertly spliced into the AUD where the taper got things started again. This little passage speaks volumes about the way an audience recording can completely outshine a soundboard tape – especially in the early 80’s. When you hear Garcia’s tone flip in as the AUD tape returns, it places you back in a completely perfect sonic landscape. Joyfully, we settle back into this aural masterpiece, and are treated to a wonderful Sugaree, as much about Jerry’s intricate solos as it is about Phil’s fantastic underpinning throughout. Phil is not to be missed here. Man Smart (Woman Smarter) latches right back into that Samson & Delilah energy. Somehow, the drummer’s beat is cycling in on itself, and the other instruments bounce on the beats defying the body to find the downbeat. An infectious dance is in the air, and you can feel the twirling girls, and the guys dancing, knees bobbing high in the air. Bobby, apparently as lost to the downbeat as we are, sings the second first about a quarter measure too early, and the rest of the band slowly catches up with him perfectly covering the misstep, and increasing the music’s ability to blur beat over beat. Truckin’ comes on like a flag waving emblem of the Grateful Dead’s legacy. Rolling out into a very nice post song jam section, the signature thunder clapping chord that comes off of the rev up section is pricelessly perfect. It explodes with such power, even the most seasoned listener can’t help but have a huge smile spread from ear to ear. The entire audience is rocketed into the stratosphere. 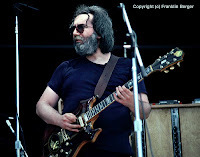 Jerry flips on a compression/distortion effect, and the band cruises forward into an ever-spiraling jam that eventually finds Garcia floating out on a glorious Other One tangent. Bittersweetly, they head into Drums, rather than the Other One that seemed so close. The Space that follows is really fine. Phil leads the entire passage, playing a gooey and dripping melody which makes this entire portion of the show far more than random noise and cacophony. Shimmering, whispering, tinkling breezes wrap everything in an otherworldly blanket. And, slowly Not Fade Away appears out of the mist. We are back in that same groove again where the downbeat is turning concentric circles upon itself, while the music drapes liquidly over everything. It’s a classic Grateful Dead run to the finish line, which includes the crowd helping Bob out when he forgets the lines to Sugar Magnolia (poor Bobby). The US Blues encore is a treat, outdone by the Satisfaction which follows it. Brimming with bright sunshine, this fantastic audience recording delivers a wonderful morning ride with the Grateful Dead. While there may not be any extended jamming to speak of, the unmistakable fingerprint of the Grateful Dead is all over this show. So, rub on some sunscreen and step under the cooling spray of the water truck hoses. The Dead are taking the stage. I was 14 when this festival hit, and at the time I was all about whatever was on the radio...and this festival was simulcast! I heard the Dead's sets, but was way too inexperienced to take much away. Didn't actually get on the bus until 7 years later. Strange that this site was going to be where I would be seeing the band outside of Northern California for the first time, but as we all know, that didn't come to be. Thanks for the memories! It's very interesting and funny! Now THIS is a show that I never ever would have sought out to hear on my own at all. Goes to show... Thank you for the pointer, noah! I went to see Joey Ramone and got to see Jerry Garcia! This was a "first" show for many people, and in fact could be seen as an early catalyst to their late 80's popularity explosion, since this show exposed them to tens of thousands of music lovers who maybe otherwise wouldnt see a Dead show. Sugar Magnolia, The ONE and Only time I ever saw Bill Graham Dance.